MESSAGE FROM GAIA: CATASTROPHIC EVENTS ARE NOT NECESSARY! 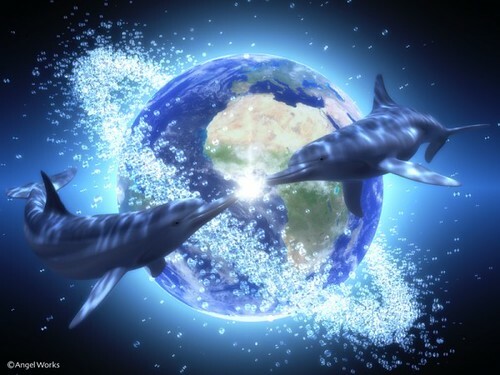 My dear ones I AM Gaia, speaking to you! You have asked Me to explain what will happen with My body in the near future. There are many who expect Me to move soon in a more dramatic way than I have done so far in the past. To those and to all those who are in fear and who believe in nearing catastrophic events, I say: there will be none of these upheavals occurring. Not in the very near future and what is beyond that depends entirely on where your human collective consciousness is heading to. In this context it has to be said that conscious intention, when expressed firmly and from the heart by a certain number of people, whereby about 8-10% are enough, can easily override the rest of the collective consciousness, whether it is conscious or unconscious. For Millenniums your collective mind has been imprinted with the desires of those who claim that I am their possession, but who did never respect and honor My spiritual condition and needs, and who therefore abused My grace, patience and loving being continuously and exploited shameless My body. They have told you via religious means that around this time I would either be completely destroyed or at least end up in catastrophic events. They have imprinted this idea into your mind so that this vision attracted and accumulated so much energy that it seems that I cannot avoid such disasters. However, catastrophic events are not necessary, my dear ones! If your heart and your mind is at peace and radiates love, there is no need for My body to violently shake or to be destroyed. It is as with your own body! If there is a disturbance or illness, it always can be self-healed when you allow the natural God-given energies to flow. Those who have abused Me for so long, did also abuse you, and were eager to indoctrinate you with the belief in disease, or even more, incurable disease and death. None of them is necessary, both is only a matter of ignorance and separation from Divine Consciousness and the realization of unity. Only if you believe that you are nothing but a body, you will die or cannot be cured. The same applies to Me: if you acknowledge, that I Myself AM foremost a spiritual being with a consciousness you understand that My body can be healed without major catastrophic events, which would destroy most of the beings who live with Me and cause for them unnecessary misery. The Divine does not need you to suffer in order that you awake to the spiritual being you in truth are. However, it is also true, that many are waking up through suffering. But be asserted, that suffering is NOT necessary to begin with. The idea of the necessity of suffering has been introduced by those who have abused Me and also you. If you live in peace with one another and love one another and respect and love Me and live in collaboration with Me, there are no catastrophic events! What is toxic and polluted and abused can be healed by humanity’s love and care, and I myself will make sure that devoted hearts will find the means to purify what has been damaged. So in that sense there is no need for major earthquakes or for violent volcano eruptions or for gigantic tsunamis and storms! I can easily harmonize Myself with minor movements of these elements, if you let Me. You have asked what you can do to make sure that the ascension process occurs in the most possible harmonic way without major disturbances. You see, when humanity lost their seat in their heart, when they lost love and true self-identity, calamities began. Therefore, if humanity restores their heart identity and love, My restoration and healing is absolutely guaranteed. In this case we all shift easily into the higher dimensions together, without disruptions. You cannot truly heal Me with your mind, dear ones. You need to enter the non-dual feeling place in your heart and envision from there and feel my healing. Embrace Me with your Peace of Heart and burnish the waves of upset with the Love of your Being. Let this smoothing vibration of love and peace embrace My whole body, especially when you expect quakes and other upheavals. Envision and feel the region where these events are expected directly in your heart and feel the oneness of us by letting the presence of your innate peace calm down what otherwise would show the sign of inflammation, – yes, look at these regions and elements as if they were inflamed. With your cooling love and calm in your heart, by fully taking these inflamed parts of My body into your loving heart, they can heal. Do this, My dear ones, from now on and never allow yourselves to follow the propaganda of disaster, which is so much cherished by those who only carry harmful intentions in their minds. As you know, creation works only from inside out. Energy and manifestation follows what you first feel and envision in your heart and then can become thereby reality. What happens to my body is entirely dependent on the consciousness and intention of humanity. We are not separate and it is you who can take responsibility for what you will experience! I love you all very dearly, you must know. But I need your help so that we can together experience a Divine Reality. In a Divine Reality disasters never occur!